We’ve had a lot of icy weather this past month, at least by Missouri standards. 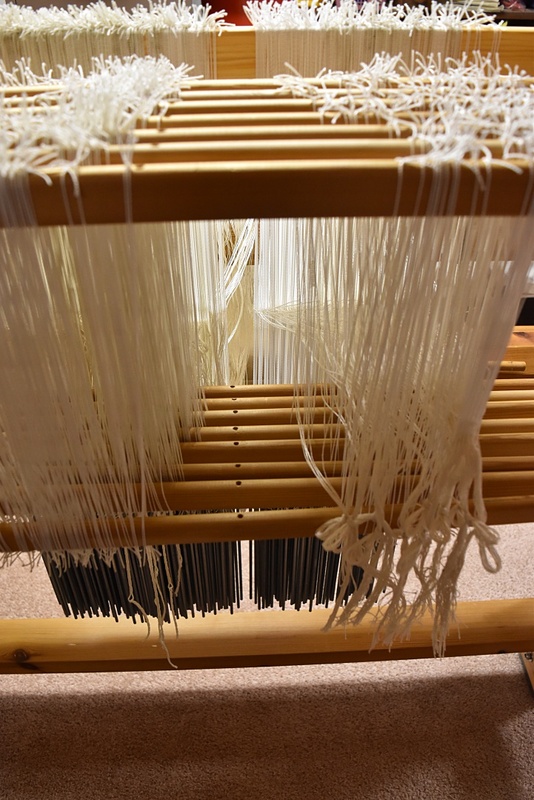 Perfect time to retreat to the studio for some serious warping! During the course of a year, while weaving fabric for utilitarian textiles, I let my mind wander a bit. Not so much that I lose my place in the treadling, but I do dream about what’s next. 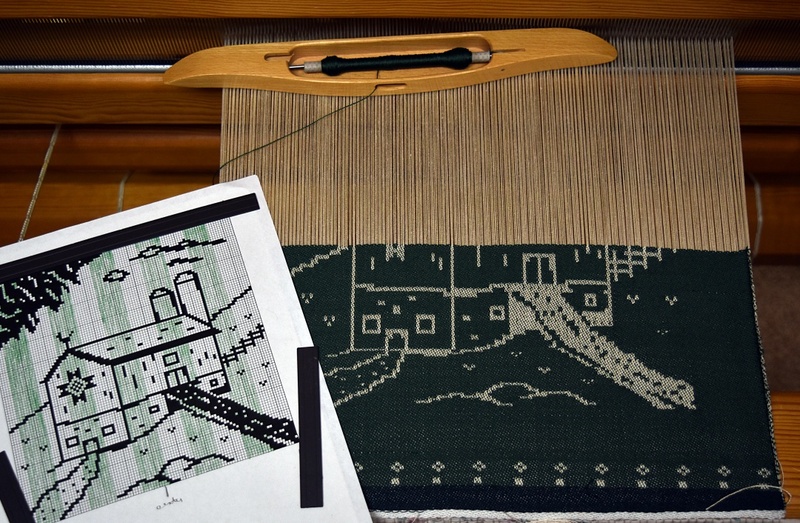 What can I weave on the drawloom that will use more draw shafts? Do I set it up for shaft draw or single unit draw? What figure can I come up with that will be easy enough for this rookie single-unit weaver? And following those wandering thoughts led here—inside the drawloom, threading 468 threads for a single unit 8-thread satin damask. This set-up will allow me to lift individual units of threads randomly for whatever figure I can graph out. It’s more free-form than the repeating patterns of shaft draw weaving but if I want, I can work those in too. There are so many motifs that can be woven, so many designs that show up in embroidery, knitting, quilting—whatever a person can put her hand to. Mediums often cross too, like the quilt patterns painted on barns. While tossing around ideas for the newly warped loom, my husband suggested putting one of those barn paintings into the picture. A perfect expression of my family’s dairying and quilting backgrounds. Idea met computer sketchpad and after several edits, I took it to the loom. Since this is a learning piece, I’m taking time to evaluate along the way. There will be adjustments if I choose to weave it again, a shadow added here, a line softened there. And while I weave, I let my mind wander, but not too much! I saw the drawloom in action when I was at Vavstuga but it still blows my mind. The level of detail you can achieve is amazing and the idea of weaving the barn, with quilt, seems like the perfect choice for you! Start small, with short projects and simple structures. Then start stretching. Try something new with each warp. Over time, you’ll get the hang of it. It helps to be part of a local learning community too. Friends are great encouragers.